MA Design Management alumna Grasheli Kusuma Andhini recently had her work featured on the catwalk as part of Paris Fashion Week. 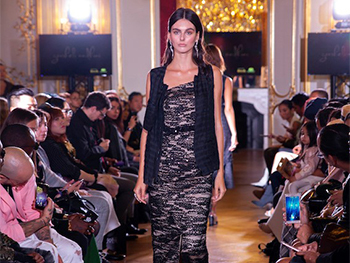 Graheli’s ‘Love Affair’ collection was included as part of The Fashion Division show held in the Haussmannian mansion area of the Hôtel Le Marois. The Fashion Division show was created by Wulan S. Haryono to give exposure to young and upcoming designers from Indonesia – the collections were selected for the uniqueness of the designs and quality of the garments. Paris Fashion Week is held in multiple venues across the capital and is considered an integral event in the fashion calendar, seen by millions across the world. It was a nerve wracking moment just before the model went out on the runway. More than anything, I was extremely happy and grateful. It was just a dream come true that my collection was on the runway, especially as it was my first international show. “Coming from a creative discipline with little knowledge of the business side, Design Management was the perfect course. It gives creative people an insight into industry, allowing them to learn about processes and procedures. This course facilitates the exploration of business in creative industries." You can follow Grasheli’s work on her Instagram account and find out more about MA Design Management at our November Postgraduate Open Day.